Allen Edwards will be the 21st head coach of the Cowboy basketball program, University of Wyoming Athletics Director Tom Burman announced Monday. Edwards assumes control of the Cowboys after serving as an assistant under Larry Shyatt the previous five seasons. With 12 appearances in postseason tournaments and 14 conference championships, Edwards has created success during his playing career at Kentucky and as an assistant the past 14 seasons. He has agreed to terms on a five-year contract with UW that includes a base salary of $200,004 per year and other guaranteed compensation of $290,000 for a total annual guaranteed compensation of $490,004. Those numbers could go up with performance-based incentives. Since joining the program in 2011, Edwards has helped the Pokes compile an overall record of 98-69. He added to his extensive postseason experience with the Cowboys qualifying for the CBI from 2012-14 and the NCAA Championships in 2015. That 2014-15 season included winning the Mountain West tournament title to secure the Pokes’ first appearance in the NCAA tournament since 2002. 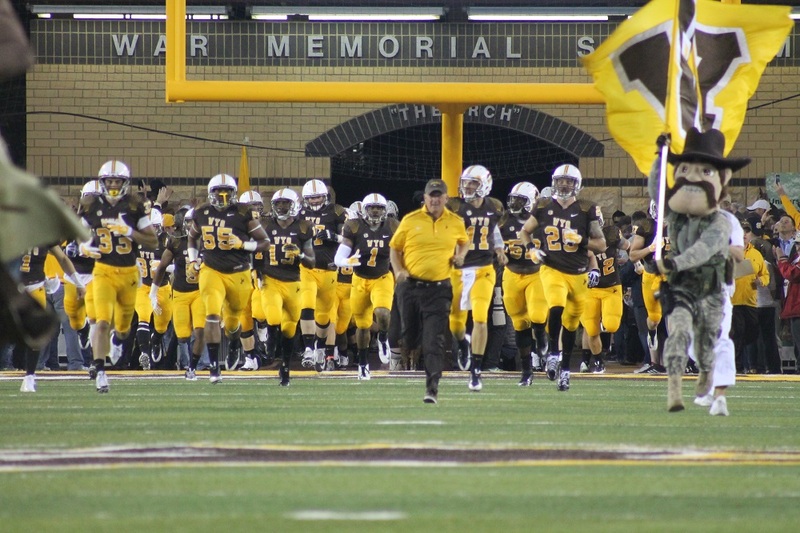 During his time in Laramie, the Cowboys have claimed six wins over top-25 opponents, including one against a top-five foe, and six players have earned 15 all-conference honors, including a MW Player of the Year and two MW Defensive Players of the Year. He helped coach Larry Nance Jr., who was picked 27th overall in the first round of last year’s NBA draft by the Los Angeles Lakers. Edwards also took the reins for one game on Jan. 22, 2014, to lead Wyoming to a come-from-behind 66-59 win at Air Force when Shyatt was ill.
Edwards came to Wyoming from Western Kentucky, where he spent the 2010-11 season under Ken McDonald as an assistant coach. The Hilltoppers finished 16-16 overall, including 8-8 in the Sun Belt Conference, with a pair of first team all-conference players. Prior to WKU, Edwards spent 2009-10 as an assistant at Towson University under head coach Pat Kennedy. Those two positions for Edwards came after a very productive three-year stint at Virginia Commonwealth University with head coach Anthony Grant from 2006-09. He helped guide the Rams to a 76-25 overall record during that time, including 45-9 in the Colonial Athletic Association, as the Rams won three conference regular-season titles and two tournament titles. VCU played in the NCAA tournament twice, including a first-round upset of Duke in 2007, and the NIT once. During that 2006-07 season, the Rams led the nation in three-point field goal percentage defense and were 10th in field goal percentage defense. Edwards helped cultivate Eric Maynor, the 20th overall pick in the 2009 NBA draft, and Larry Sanders, the 15th overall selection in the 2010 NBA draft. Edwards’ first full-time assistant position was at Morehead State from 2003-06 under head coach Kyle Macy. He previously spent the 2002-03 as a special assistant to head coach Tubby Smith at Kentucky, as he returned to complete his degree in sociology. During that season, the Wildcats went 16-0 in the SEC to win the conference regular season and tournament and advance to the NCAA’s Elite Eight. Edwards enjoyed a tremendous playing career at Kentucky from 1995-98 that included three seasons under Rick Pitino and one under Smith. The Wildcats advanced to three-straight Final Fours during Edwards’ sophomore, junior and senior seasons, including winning national titles in 1996 and 1998. During his freshman campaign, Kentucky made the Elite Eight. With Edwards, the Wildcats compiled a 132-16 overall record and won three SEC regular-season crowns and three tournament titles. He averaged 9.2 points, 3.3 assists and 3.3 rebounds as a senior. Following his collegiate career, Edwards played professionally in the CBA and the IBL. A native of Miami, Edwards played his prep career at Miami Senior High School where he and his two brothers collected five prep state titles. Allen is married to the former LaTanya Webb, a two-time All-SEC volleyball player at Kentucky. They have two daughters, Mai’a (15) and Landree (4), and a son, Jaxson (8). Edwards will be 40 years old when the 2016-17 season starts.